Welcome. We are a nationwide deliverer of On-site Inspections and Engineering Foundation Certifications for the Mobile Home industry. We also provide engineering certifications and structural reports for single family residential (site-built) homes. 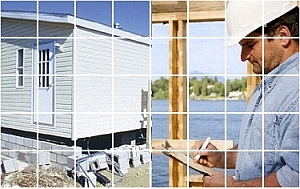 If you need a Engineer's Certification for Manufactured Housing Foundation, you may Schedule an Inspection here. Are you a mortgage lender, loan officer, or real estate agent? If so, click here. Are you a manufactured home owner? If so, click here. We certify that foundations are compliant to HUD/FHA, VA, and Conventional Lending requirements and standards. Our Professionally Licensed Engineers ensure that home foundations are in compliance with HUD/FHA, VA, and Conventional Lending requirements and other national standards. We perform On-site Inspections and Engineering Foundation Certifications for the Mobile Home industry to ensure conformance to federal government regulations for mortgage lenders, loan officers, real estate agents, insurance agents, and home owners. If the manufactured (mobile) home foundation is in conformance with governing HUD/FHA, VA, and Conventional Lending standard, we issue a Engineer's Foundation Certification to ensure that loan guidelines are met. Not only do we issue structural engineering foundation certificates, but we are a full service structural engineering design firm for the manufactured (mobile) housing industry. We can design a retrofit for an existing non-compliant mobile home foundation, or engineer a custom foundation design for installation of new manufactured home directly from the manufacturer. If you have questions about our Mobile Home Foundation Certs services, please feel free to contact us. Please explore our full range of manufactured (mobile) home foundation certification and design services and see what we can do for you.